• Our larger capacity travel coffee mug comes with lid to prevent spills when on the go. Please, NOTE: The lid is NOT 100% leak-proof. The coffee/tea may spill if the mug is left on it's side or held upside down. • Our mug comes in an unique original gift box, sure to please coffee & tea lover's, campers, hikers or simply travellers. Tree Logo on the bottom of every mug is your assurance that you have our genuine high quality and eco-friendly product. Bamboo Mug is fully recyclable. ✅ NO LEAKS - Our insulated mugs come with lids to prevent spills when on the go. You can take our universal mug with you to work, university, camping, hiking or enjoy your favorite drink on the way in the car. NOTE: The lid is NOT 100% leak-proof. The coffee/tea may spill if the mug is left on it's side or held upside down. ✅ ECO-FRIENDLY - Our mugs are 100% eco-friendly, made with renewable materials. Each mug is handcrafted in 100% organically grown bamboo creating a uniquely design and stylish look. ✅ 100% no toxins, epoxies or BPA. 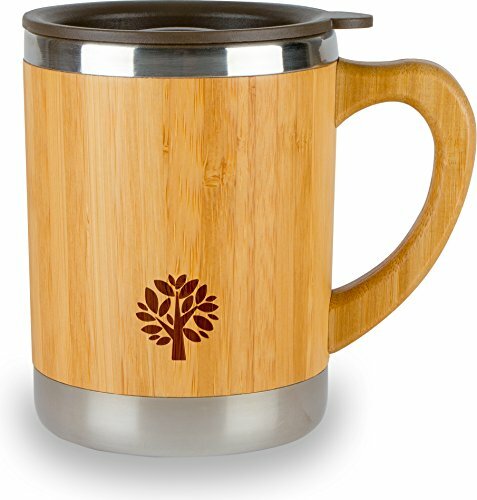 ✅ BEST GIFT IDEA - Premium Packaging - Our bamboo portable mug is the good birthday or anniversary gift for coffee lovers, dad, mom, grandmother, husband, wife, son, daughter, or boyfriend and friends for any occasion, birthday, Christmas, New Year and other holidays. It's the best personalized gift idea! If you have any questions about this product by JJecommUS, contact us by completing and submitting the form below. If you are looking for a specif part number, please include it with your message.